The plaintiff cannot carry his burden of proving that the material concerning him published on the web site www.aligus.com is false, because the factual statements about him published on the web site are substantially accurate, and the statements of opinion about him cannot be proven false as a matter of law. The material concerning the plaintiff published on the web site www.aligus.com constitutes privileged communication to the public about a matter of public concern. The plaintiff has instituted this action in bad faith and for improper purpose, namely to utilize the judicial process as a means to harass the defendants and to intimidate them into foregoing their exercise of the right of free speech accorded them by the First Amendment to the Constitution of the United States and by Article I, §14 of the Constitution of North Carolina. The relief prayed for by the plaintiff includes prior restraint on the defendants' speech, the granting of which would violate the defendants' rights as guaranteed by the First and Fourteenth Amendments to the Constitution of the United States and by Article I, §14 of the Constitution of North Carolina. NANCY G. DEAS and EDNA E. DEAS, Defendants. This is an action for libel brought by plaintiff Kevin A. Monce against defendants Nancy G. Deas and Edna E. Deas for the publication of statements on their website, aligus.com, impeaching Dr. Monce in his trade or profession. 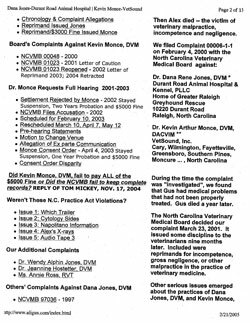 Dr. Monce is a licensed veterinarian and the statements published by the Deas falsely assert that he has committed "Veterinary Malpractice, Incompetence & Negligence" and falsely assert that he has been disciplined by the North Carolina Veterinary Medical Board "for incompetence, gross negligence, or other malpractice in the practice of veterinary medicine." 1. The court has jurisdiction of this action pursuant to G.S. 7A-243. 2. Venue is proper in Wake County pursuant to G.S. 1-82 because defendants are residents of the county. 3. Plaintiff Kevin A. Monce has been a licensed veterinarian in North Carolina since 1994 and is a resident of Chatham County. He currently practices veterinary medicine at the PetSound Animal Hospital in Cary in Wake County. 4. Defendant Nancy G. Deas is a resident of Wake County and, together with her sister Edna E. Deas, maintains the web site aligus.com and writes and publishes the content of that web site. 5. Defendant Edna E. Deas is a resident of Wake County and, together with her sister Nancy G. Deas, maintains the web site aligus.com and writes and publishes the content of that web site. 6. Kevin M once graduated with high honor from the University of Kentucky in 1980. He received his Doctor of Veterinary Medicine degree, with high honors, from Auburn University in 1984. He completed his internship at Texas A & M University in 1985 and his residency at North Carolina State University in 1994. Dr. Monce is a Diplomate in the American College of Veterinary Internal Medicine and is a member of the Phi Kappa Phi and Phi Zeta honor societies. 7. Kevin Monce was licensed to practice veterinary medicine in North Carolina in 1994 by the North Carolina Veterinary Medical Board and he has maintained his license since that time. 8. Since his licensing in 1994 Dr. Monce has practiced veterinary medicine continuously in North Carolina. From 1994 through 1997 Dr. Monce owned a referral practice, accepting complicated internal medicine cases from general practice veterinarians. From 1998 through 2004 his practice primarily was as a consulting veterinarian, providing ultrasound interpretations and ultrasound guided procedures for other veterinarians and otherwise consulting on internal medicine cases and procedures. Since 2005 he has practices as a primary care veterinarian in Cary. 9. Dr. Monce's professional reputation is important to him as a veterinarian, and any harm to that reputation is damaging to him in his profession. 10. Defendants Nancy and Edna Deas created and maintain and write the copy for a web site found at aligus.com. The web site is primarily devoted to the story of their complaints concerning the death of their 14-year old dog, a terrier named Alex, in January 2000. 11. 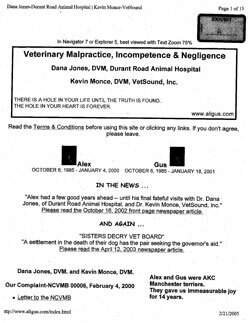 In 2000 the Deas filed complaints with the Veterinary Medical Board against Dr. Dana Jones and Dr. Monce concerning the treatment of Alex before his death, alleging a variety of acts of neglect and malpractice. Dr. Jones was the primary veterinarian treating Alex at that time and Dr. Monce was consulted by Dr. Jones. 12. The Veterinary Medical Board eventually issued a reprimand to Dr. Jones, which was accepted by Dr. Jones. 13. The Veterinary Medical Board also issued a notice of reprimand against Dr. Monce, but Dr. Monce contested the reprimand and the Veterinary Medical Board initiated a contested case hearing in the Office of Administrative Hearings. 15. The headline of the home page of the aligus.com web site reads, "Veterinary Malpractice, Incompetence & Negligence". Immediately below that headline are the words, "Dana Jones, DVM, Durant Road Animal Hospital" and the words "Kevin Monce DVM, VetSound, Inc."
16. Also appearing on the home page of the web site is the following: "The North Carolina Veterinary Medical Board decided our complaint March 23, 2001. It issued some discipline to the veterinarians nine months later. Included were reprimands for incompetence, gross negligence, or other malpractice in the practice of veterinary medicine." 17. A true copy of the pages from the aligus.com web site are attached as Exhibit A. 18. An ordinary person's understanding of the statements published by the Deas sisters on their web site, and the understanding desired and intended by the Deas sisters, is that Kevin Monce has committed veterinary malpractice and is incompetent and negligent as a veterinarian, and that the Veterinary Medical Board has found and declared him to have committed malpractice and to have been incompetent and grossly negligent in the practice of veterinary medicine. Those statements are false. 19. The statements made by the Deas sisters and published on their web site have been intentionally published to the public at large and are intended and calculated to impeach Dr. M once in his profession and have been made without regard to the truth. 20. The statements made by the Deas sisters and published on their web site have harmed and injured Dr. Monc e in his profession. 21. The allegations of paragraph 1 through 20 are incorporated by reference. 22. The statements made by the Deas sisters and published on their web site, aligus.com, libel Kevin Monce in that they impeach and harm him in his profession. 23. The statements made by the Deas sisters and published on their web site are libelous per se. 1. Hold that the statements made by the defendants and published on their web site are libelous per se and harm the plaintiff in his profession. 2. Order that defendants pay to plaintiff compensatory damages in excess of $10,000. 3. Order that the defendants pay to plaintiff punitive damages. 4. Order defendants to cease publication of the libelous statements on their web site in any other publication. 5. Order defendants to replace the current content of their web site with statements approved by plaintiff and the court acknowledging that the incorrectness of their claims and apologizing to plaintiff. 6. Order defendants to make reasonable efforts, approved by the court, to contact and notify readers of the aligus.com web site that the statements made on that site concerning Dr. Monce were false. KEVIN A. MONCE, being first duly sworn, deposes and says that I am the plaintiff in this action; that I have read the foregoing document and that the same is true of my own knowledge except as to those matters and things therein stated upon information and belief, and as to those I believe them to be true. this 23 day of March, 2005.